The hills of upstate New York are now barren of leaves. Yet speeding down I-88 between Albany and Binghamton last Friday, I was enjoying the scenery: the many grey hills spotted with evergreens still made for an interesting and photogenic landscape. There was so much of it to enjoy in the nearly two hour drive between cities, made even nicer by the light traffic on this largely neglected interstate. An occasional shower spattered my windshield and grey clouds largely took over by the time I arrived in Binghamton but at least it was unseasonably mild. The grey clouds actually made the place feel like home, which in fact it was for me from 1963 through 1972. Starting in November and usually lasting until spring, Binghamton is generally a dark and dreary place, a combination of diminishing daylight and clouds that form over Lake Erie and thicken in the prevailing westerly winds. His dad, a former engineer who worked at the now largely vanquished IBM Endicott made it to 87, and finally passed on November 1, a victim of congestive heart failure. I hadn’t seen much of his father when I was young. Shortly after arriving at the Allen Memorial Home in nearby Endicott and seeing so many pictures of him on poster board, my memories of Tom’s dad flooded back. He was Irish, he was passionate, he usually had a big smile on his face and he was very, very Catholic. He and his wife raised nine children including my friend Tom, and not very well by some accounts. He worked days and his wife (a nurse) worked nights. This didn’t leave much time for a relationship or for parenting. They eventually divorced, which should have estranged him from the Catholic Church. At least the priests at St. Patrick’s Church in Binghamton were forgiving. Three priests and a deacon in vestments were at his funeral mass, and the deacon spoke warmly about Tom, their time together, and their shared passion for sports. At the funeral home I saw few signs of mourning from my friend’s family. In some ways their mood felt joyous. For me this journey became something of a time warp. I had been back to Binghamton five times over the forty plus years, but I hadn’t really connected with anyone I knew from my years there. At least I had the opportunity with Tom’s family, which included three generations now. Tom was now the oldest male in the family. His older sister has had that privilege for a couple of decades; their mom passed away from cancer in the 1990s. In fact, Tom’s extended family looked great: thin for the most part, including Tom who had dropped forty pounds. Tom Sr.’s death was long anticipated, so most had moved through the grieving process while he was declining. Tom I knew, but it was impossible to name these grown up faces after so many years. Those who were old enough usually remembered me, and shared a memory. I remembered the youngest child now in her forties in diapers in their living room. Tom’s house had a color TV and she was watching Sesame Street on it when the show was still new. I was jealous of Tom’s family because my parents thought color TVs too expensive, so we were relegated to black and white. Whatever family trauma there was forty some years earlier seemed wholly gone. Tom’s family proved to be a lively, civilized and grounded bunch, all instantly likeable. In some ways I felt more comfortable with them than I do with my own siblings. Tom’s family may have had issues, but they were a passionate bunch. My house was more saccharine and my mother played the role of dutiful Stepford wife. No wonder I liked hanging out with Tom. His house felt real. But there was more. Tom was and remains an intensely creative person full of energy and passion. It must have been due to all that Irish blood. As I worked my way down the receiving line I felt a lot of genuine warmth flecked with humor and remembrances. Tom is one of nine children; I am one of eight. My family scattered like the wind across the nation. Six of Tom’s siblings stayed in the Binghamton area and extended their family’s roots there. Most had dodged and parried with life pretty well in spite of a challenging childhood, but others had dealt with larger problems. An older sister spent decades fighting addictions but she told me she had been clean and sober for twenty-five years. The sun was close to setting when I arrived, but I drove by our old house and enjoyed the fall colors still hanging on a tree on our old front lawn. The house has been extended into the backyard. Its original six bedrooms are now probably more like ten bedrooms. In fact, the house is now owned by the State of New York and it houses developmentally disabled adults. While Tom hung with family that evening, I did a driving tour of the area (“The Triple Cities”) in the dark, following paths I knew so well from childhood, but also from exploring the area again on Google Maps. I had fond memories of my father taking us to Binghamton Airport, so I drove there in the dark along Farm to Market Road. I drove down Vestal Parkway, climbed Taft Avenue in Endicott and wandered the back streets behind our old house in the darkness. I watched the stars appear periodically from behind the clouds, so much clearer here where the city lights are more muted. The Binghamton area had often felt sad in past visits, but this time it felt fully on the mend. Dinner came from the food court at the Johnson City Wegmans. Leaving my car in the parking lot of my hotel, I noted a fox’s bright eyes looking back at me in the dark from the nearby woods. St. Patrick’s Catholic Church turned out to be an ornate church by Catholic standards with impressive stained glass windows and altarpieces that imitated Gothic spires. By any measure, Tom’s dad went out well. A huge organ in the back of the church and a cantor on the altar provided deeply spiritual music mixed with Irish melodies during the funeral mass. It’s a large church and was more than half full; clearly Tom’s father was a man beloved in the church and in the community. Tom’s family did a wonderful job of arranging a memorable and emotional service. In the lobby after the service Tom pulled me over. He reintroduced me to a friend I knew even longer than him, Peter, who I first met in first grade and often played with after school. Age 58, Pete hadn’t changed that much but related a brush with mortality: he a heart attack a few years back. At the reception after the mass we ate food, laughed, traded memories and snapped pictures. There were no tears to note but plenty of laughter. People reconnected, and that included me. For the first time in more than forty years I felt reconnected with the area I always considered home. There were still friends here; we had just lost touch. I was back home for supper, doing a reverse commute. The hills along I-88 and I-90 were still pretty, though barren, but the temperature had plummeted. It was cold but I felt strangely glowing. It came from the deep embers of a long ago connection thought lost but now recovered somehow. The next phase of our vacation took us west from Binghamton to a journey along New York State’s Southern Tier. That’s what they call that part of the state just to the north of the Pennsylvania line. Binghamton qualifies as being part of the southern tier, but there are two hundred miles more of the area, stretching westward past Jamestown to the shores of Lake Erie. It is a very pretty area of New York but is an area that is largely bypassed by tourists. It’s their loss because it consists of more than two hundred miles of rolling green hills and occasional surprises. Venture fifty miles northward and you are into New York’s Finger Lakes region, which consists of dazzlingly beautiful blue glacial lakes. The Finger Lakes are also wine country, so if you are into wineries that area makes for a terrific vacation. We spoke to one couple that took in four winery tours in one day. Owego. Owego sits twenty miles or so west of the Triple Cities. It too suffers from rust belt syndrome, which means it is unduly affected by abandoned or rundown buildings. Like Johnson City and Endicott, it hugs the banks of the Susquehanna River. If you can look past the decaying infrastructure, you can see lots of lovely Victorian houses and pretty public parks. If you like village life, less than four thousand people actually live in Owego. But there are better choices if you want to live in the Southern Tier, so keep reading. Buttermilk Falls. Buttermilk Falls is a New York State park that sits just south of Ithaca. Ithaca is primarily known for Cornell, its Ivy League university, but Ithaca State is also there and is also a fine school. 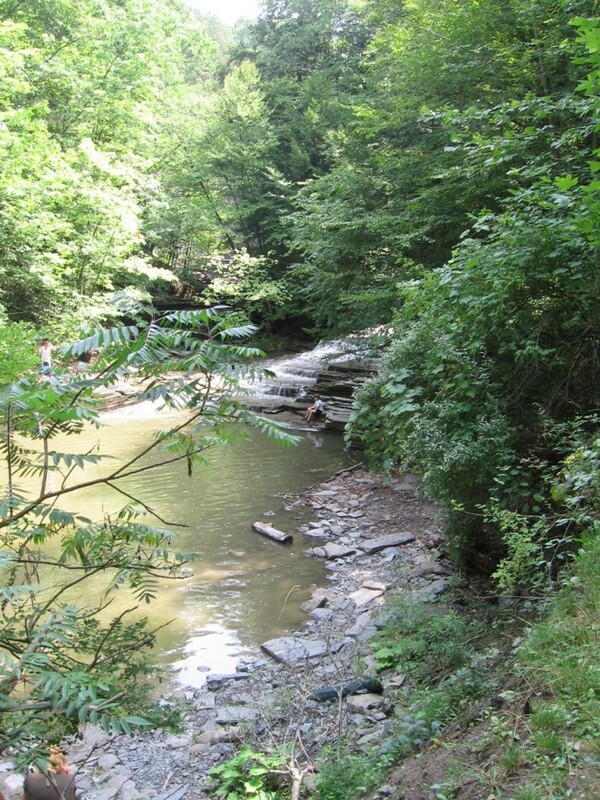 I had hazy memories from my youth of Buttermilk Falls. Getting to the falls in 2012 turned out to be challenging because only the parking lot near the entrance was open. No park rangers were in evidence either. So hardy souls like my wife and I walked down the road a half a mile or so and eventually found the falls, which are pretty but very modest, and are fed by a lake controlled by a dam at the summit. Walking up to the lake is worth the extra climbing, and a path will take you over the dam as well. You can hope to catch some fish but most of the time you are not allowed to swim. The falls themselves are rather uninspiring, at least during the low flow season, which was when we visited. However, a bucolic meadow near the parking lot and the muted sounds of nature walking the road made the visit strangely positive, as I felt closer to nature than I have in the last few years. Watkins Glen. My wife thought Watkins Glen was just the location of a racetrack. So she was blown away when she discovered the actual glen at Watkins Glen. For several miles a modest stream eroding over millennium through shale rock provides a charming and beautiful example of natural forces at their finest. This glen is not for couch potatoes, as there are extensive paths and staircases through the glen, as well as a trail along the rim. 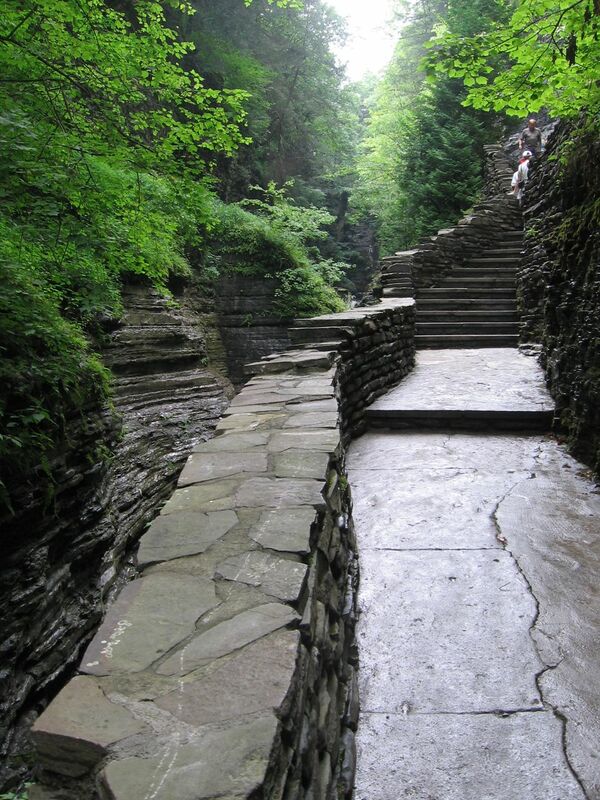 Watkins Glen should really be elevated to a national park because it is that special and pretty. In spots, tunnels were blown through the abundant shale rock so that tourists could get inside the glen. There is no swimming in the glen itself, but there is an Olympic size swimming pool in the south parking area, as well as a picnic area and a lily pond. If you are in the Finger Lakes region, Watkins Glen is a must see attraction and available for the bargain price of eight dollars a car for parking. Caution: the path inside the glen is slippery when wet, and it is usually wet. A pair of sturdy hiking shoes and good calf muscles are prerequisites for enjoying the glen. My wife compared its stairs to those at Cirith Ungol (from The Lord of the Rings), only these stairs are much sturdier, and the gorge is spectacularly beautiful, unlike Mordor. No need to worry about orcs here, but it can be hard to dodge all the camera-snapping tourists, because pretty much anywhere you point the camera you are guaranteed to get a great shot. Corning. If you had to pick a neat and healthy city to retire to in the Southern Tier, Corning is the city. It is anchored by the Corning Corporation, so the health of the city goes up and down with the company’s prosperity. Corning is known for glass, and has been a consistent pioneer in glass technologies, including fiber optic cable and shatter-resistant Gorilla Glass such as you will find on your iPad and iPhones. 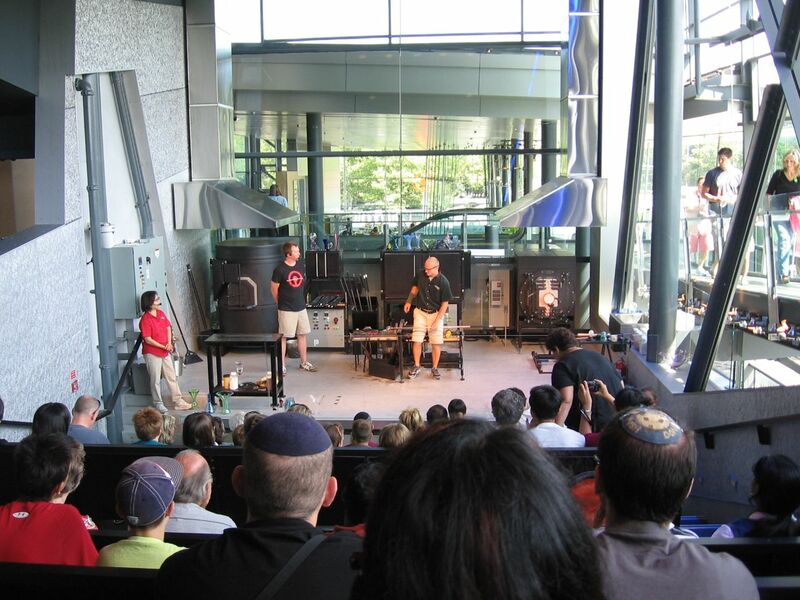 The Corning Museum of Glass is a four-star and unique museum that features equal parts glass art and glass technology exhibits, glass blowing and shaping demonstrations by glass artisans as well as a large gift shop where the items for sale are actually reasonably priced. The city of Corning itself is vibrant and healthy, and the higher wages that Corning pays employees promotes a broad prosperity within the city. There are many lovely tree-lined streets, mostly consisting of old Victorian houses that are well maintained and come complete with back alleys. If I had to retire in the Southern Tier, Corning would be a much better choice than Endwell, where I grew up. Brew pubs and great restaurants line Market Street. Corning is modern, but also quaint and charming. It is also surprisingly youthful and ethnically diverse. You can stay at the Radisson if you want, but we were glad to spend a night at the Rosewood Inn, a B&B on Second Street where we were warmly greeted and enjoyed an excellent room with a large, claw foot tub and a canopy bed. I took my first real bath in years, and it was delightful. Corning is the southern tier at its most livable. Jamestown. We drove through Jamestown and did not have a chance for a proper introduction. Jamestown is a decently sized city and at least within its city limits is quite attractive. It is also the home to Lucille Ball and annually throws a Lucille Ball comedy festival. Alas, we were too late for it. The city is located at the eastern end of Chautauqua Lake, a picture postcard pretty lake more than ten miles long and ideal for all sorts of fresh water lake recreation. Chautauqua Institution. The Chautauqua Institution goes back to the 19th century and is anchored to Chautauqua Lake. It’s hard to explain Chautauqua but it has many fans, going back to President Ulysses S. Grant. Essentially it is a community of mostly rich white people and their children who seek refuge (mostly during the summer) in a place that values religion, music, learning and recreation. For me, it is a near ideal vacation spot because I value a mixture of nature, which the lake provides in abundance, along with learning (the institution provides fabulous lectures) along with an appreciation for the arts. Behind this large gated community are thousands of people (at least during the summer) who share similar progressive values, are highly educated, highly cultured and are basically happy people. It’s a surreal and safe place but that is part of its charm. It sort of models how society should be but rarely is. Children are especially welcome and seem charmed by the place, riding bikes down paths and streets, going to day camps and playing down on the beach. We took the official tour and found the happiness and exuberance of its residents was overwhelming. Really well moneyed people own very expensive houses on tiny lots in Chautauqua, usually passed down from generation to generation. There are also houses and apartments for rent and hotel rooms available as well. 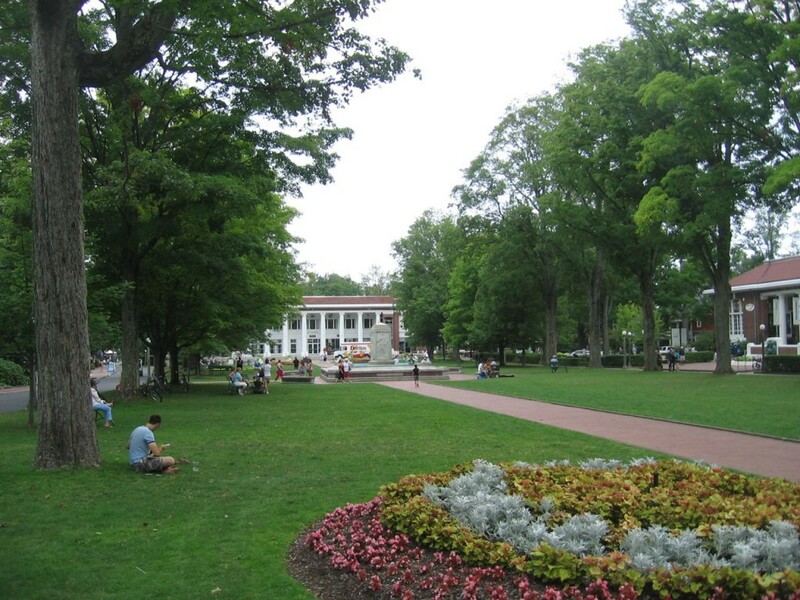 Just don’t expect a Pizza Hut or a Walmart on this campus. The very idea! Expect to walk or bike everywhere, which won’t take long as everything is very close together. Most people have to leave their cars in a lot at the edge of the property. Do expect to be surrounded by very talented people, youth full of energy and talent, and to revel in boating, fresh water swimming, wonderful lectures, seminars, lots of live theater and first class music. I haven’t priced what a vacation costs at this resort, but it looks pricey. I suspect I will scrape together the money somehow. I will be back probably as regularly as I can afford to. Can you really go home again if no one is there? Yes, you can, providing you don’t want to live in the space you used to inhabit (for about forty years it has been occupied by other people) and you don’t mind if there is no one really to call on. There probably are people in the Binghamton area who might know me and I might know them, but I don’t know where to find them, they don’t know that I’m here and if we remember each other at all we’ll probably confuse names, dates and facts. So instead former residents like me arrive and leave anonymously, and the closest you come to confessing that you are a native is to the waitress at Christie’s steakhouse in Johnson City, who receives the information with a blank stare. “The Triple Cities” we used to call them, but Binghamton, Endicott and Johnson City are hardly the only trio of cities in New York State with the moniker. There is, for example, Albany, Schenectady and Troy. I was born in Schenectady and expect to be in Troy in October. Nor are they all real cities. Endicott promotes itself as a village. Endwell, where I grew up next door to Endicott, is part of the Town of Union (which includes Maine to the north) and may be bigger than Endicott. Across the Susquehanna on its southern side is Vestal, neither a city nor a village, but a town. Arguably Endicott was a city in its glory days of the 1950s. Back then the shoe factories lining the railroads were cranking out shoes by the railcar full. The smell of tanning leather was pervasive as you drove down North Street. Then there was also IBM, busy building the precursors to the information age: electric typewriters but also mainframe computers that read programs from stacks of paper cards and saved data to giant reels of magnetic tape. The abandoned shoe factory eyesores are now finally gone. This is probably for the best, because they were ugly and safety hazards. If Endicott is to have a renaissance, it could not happen until these eyesores were demolished. Still, they should have kept one, prettified it up and sold tickets to tourists to see it. History sells in upstate New York. IBM is virtually gone, with only a couple of hundred employees in Endicott. The huge IBM administrative building still proudly proclaiming its name on North Street is still there, and it is easy to mistake for a high school. The boxy white concrete IBM buildings along McKinley Avenue remain as well. Not much has replaced these employment centers, which has resulted in the predictable result: lots of boarded up storefronts. When IBM mostly left, a company called Huron took over and is now marketing the former IBM campus to prospective employers. Arguably, Endicott would be a great value to any prospective employer. There is no rush hour to worry about, plenty of cheap real estate and there is never a problem with finding a parking space, except as I discovered at the George F. Johnson Memorial Library. Some things are new on Washington Avenue, Endicott’s old downtown, including an “adult emporium”. In 2012, the Triple Cities are not exactly looking up but they definitely feel less bleak than they did when I last visited in 2000. 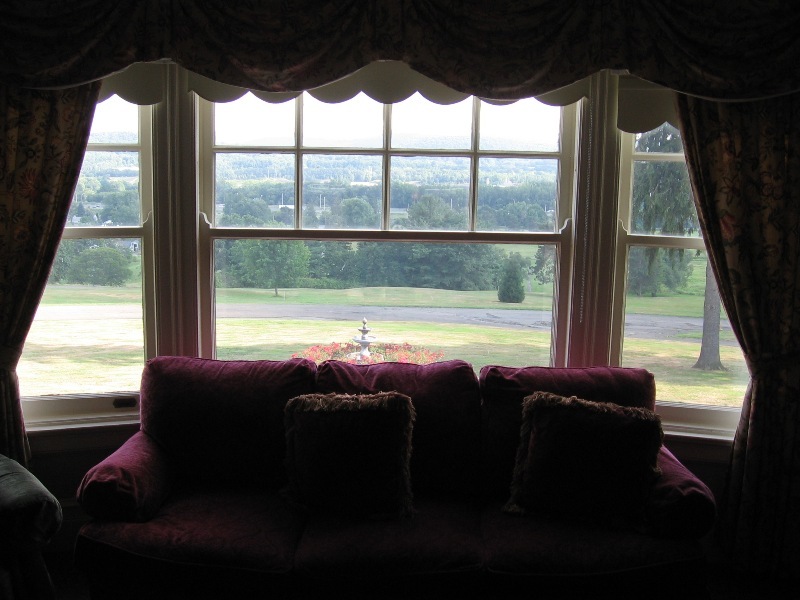 It was perhaps exemplified by our choice of lodging, Traditions in the Glen, a four-star hotel, spa and golf resort occupying what used to be the IBM Country Club, before IBM vamoosed. The elite of the area, such as they are, seem to hang out here. It is a lovely resort, beautifully restored and feeling much like a scaled down and less pricey version of The Homestead, a huge resort we visited in 2010 in Virginia’s Blue Ridge Mountains. In the lobby you can see pictures of the country club at or before I remembered it, with pictures of IBM founder Thomas Watson, Sr. taking the first shot on the then new country club, or Bing Crosby with Jack Nicholson’s trainer swinging away on the course. Unfortunately, it’s but a short drive of a mile or so from Traditions down Watson Boulevard where you will find suboptimal retail: an ugly old coin Laundromat, a Dollar General store and a Yum Yum ice cream stand that looks like it deferred about twenty years of maintenance. Much of my home town of Endwell is still a sad place. East Main Street in particular is distressed. And yet, there is community along East Main Street. Wander down Davis Drive and onto Stack Avenue, where my friend Tom and his family used to live, and you find a real family community just as nice, if not nicer, than my memories of it from the 1960s and 1970s. Nearby Christ the King Church has been sold to an evangelical faith, perhaps for hard cash to pay off various priest child abuse suits. It is now the Triumphant Life Church, and they must be doing well because the building has been expanded. The old parochial school across the parking lot where I suffered eight years of elementary school under the watchful eyes of frequently tyrannical sisters remains boarded up. Many of the windows are covered in plywood and the blue plastic veneer siding is fading and peels. Catholicism is dying in The Triple Cities, as evidenced by the consolidation of churches and parochial schools, and is being slowly replaced by evangelical faiths like the Triumphant Life Church. A high school in Endicott where I spent a little over a year is still there, but is now a junior high. Seton Catholic High School was relocated to Binghamton. The houses are newer in Endwell the further north you go. My old neighborhood along Scribner Drive feels reasonably well kept up. What is different is vegetation: lots more of it with forty years to settle in. Our old house at the corner of Scribner and Winston drives has been transformed over forty years. There is a lot of natural landscaping in the backyard and more trees. The garage has been turned into a room, and there is an additional driveway along Winston Drive. Otherwise the neighborhood remains inviting and a healthy place to raise children, with Homer Brink Elementary (where I went to kindergarten) a few short and safe blocks down the street. Forty years have not eroded the terrain either. The hills of Endwell and Endicott remain steep and challenging, and doubtless it remains difficult to get to houses at the top of the hill after a snowfall. A four wheel drive vehicle is recommended for those homeowners. For me the heart of Endwell is the intersection at Hooper and Country Club roads. All the retail establishments I recall are gone, but new ones have come to supplant them including a large community credit union. The firehouse remains. A Dunkin Donuts has moved in as well, and today that chain and Dollar General stores seem to have taken over the Southern Tier. Still, I could retire back to this area because Johnson City has a Wegmans supermarket, and it is just like the Wegmans we have back near our real home. Surely, a community is civilized and shows fortitude if a Wegmans has taken up residence. There was not time for a proper tour of the area when you arrive late in the afternoon and leave around noon the next day after taking time to do your laundry at an Endicott Laundromat. We merely drove through Binghamton. What we saw of Johnson City looked a bit more hopeful than it did in 2000, although my father’s former General Electric Plant, sold and resold a few times, is now boarded up too. Recent floods caused a lot of damage to an area that was already distressed. The area has been abused and kicked around, but it is hardly dead. It may be on an almost imperceptible rebirth. Its gentle green hills and usually benign Susquehanna and Chenango Rivers give it a peaceful and comforting feeling, interrupted only by the annoyance of swarms of gnats during the summer. It needs some company with bigger pockets than the Huron Corporation to believe in it again. I hope that someday true vitality returns to the community I will probably always consider my home. I’ve been planning our trip to Canada in late August. We’ve been meaning to do a Canadian vacation for years. But it seems we always found more desirable vacation destinations (Arizona, Hawaii, Yellowstone) to hit first. Now we are getting around to it. My daughter Rosie has already been to Montreal with her French class. As a top French student (and someone who professes to want to live in France) it took no arm-twisting to get her to agree. But we will only spend a couple days in French speaking Quebec. The bulk of our vacation will be spent in Ontario. Most of it will be in Toronto, but we will also spend a couple days in Stratford. This city is renown for its season of plays and musicals, many with a Shakespearean bent. As theater sluts it is a natural destination, but Toronto also offers theatrical possibilities. I am sure I will enjoy visiting Canada. We have traveled across Ontario before on our way to Michigan and have seen Niagara Falls. But perhaps the most interesting part for me will be the way stops coming and going. Because between Virginia and Canada lies New York State. And as someone who spent his formative years in upstate New York, the state still has the call of home. My family has wholly vacated New York State. At one time there were ten of us living under one roof in Endwell (a town near Binghamton) and now we are all scattered elsewhere. There are not even any old neighbors or friends that I know about still living in my old neighborhood. Nonetheless the lure is powerful. I made an overnight foray to Endwell in 1982 and spent a few hours there in 1995. More recently in 2001 my sister Mary and I spent a couple days there with our children. This was the best of the three experiences for me since I had time to visit old haunts and neighborhoods. Having Mary there was also invaluable since she we could trade memories. This time I hope to at least spend an evening near Endwell. But I also hope to return to the city of my birth. I haven’t been there since I left it in January 1963. I was born in Schenectady and spent my first six years across the Mohawk River in a modest and overcrowded house in nearby Scotia. I must have had fun growing up there but my memories of the place are scattered and dim. Schenectady will be a place to spend the night en route to Montreal. But hopefully I will at least have a chance to see my old house and elementary school. Altogether between Scotia (1957-1963) and Endwell (1963-1972) I spent nearly sixteen years living in upstate New York. I moved to the Washington area in 1978 after graduating college, so in reality I’ve spent most of my life here. In many ways I do feel at home here in the Washington area. The climate here is not bad and the growing season starts early and lingers late. I’ve never lived in a place where spring has been so colorful. And yet the lure of my birth state is palpable. It makes no sense but as soon as I cross into New York State a feeling of peace and contentment washes over me. Everything feels right. Everything looks right. I am home. I often wonder if life makes me an early widower whether I would choose to move back to New York State. I doubt I could arm twist my wife into relocating there. She’s from the Midwest so she would prefer to retire there. For her home is a place where you buy “pop” at the store instead of “soda”, the people are perceived to be uniformly friendly and the land is flat as a pancake. There are plenty of good reasons I can think of why I should pick other places to retire. Lake effect snow is certainly a compelling reason to hither thee elsewhere; I remember two feet or more of snow in one storm were not uncommon. Temperature is another. While Washington is more benign, New York State gets cold. It’s rare in DC to see a temperature below zero. In New York State it is not all that unusual to wake up to -10 or -20 during the height of winter. And there were other negative aspects of living in the Southern Tier that I had forgotten. The Binghamton area is basically in Appalachia. Its economy was in the toilet when we lived there and it has not improved. Unlike Northern Virginia, which is in a constant state of change (go away for five years and you may not recognize the place), the Triple Cities are stuck in a time warp. Except today the Endicott Johnson shoe factories are closed, and IBM seems to have only a token presence in downtown Endicott. There doesn’t appear to be any substantial industry left. Real estate is dirt cheap. Boarded up, poorly maintained and abandoned houses are plentiful. In addition I’m not too hot on softening my own water. And until I returned during the summer in 2001 I had forgotten about the gnats. The valley is overrun with them. Had I arrived in the spring I would have also recalled the return of black fly season. The Binghamton area also had the reputation of being the second most overcast city in the country right behind Seattle. I guess I wouldn’t have to worry about contracting skin cancer. No, there is no reason to live there again. Except, of course, the rolling green hills that abound everywhere, the lovely omnipresent maple trees and the intoxicating sound they make in the breeze. There is also the closeness of nature. In Virginia you have to drive to see serious nature. In Endwell if it’s not outside your back door it is at most a mile or two away. It’s hard to separate nostalgia from fact sometimes, but Endwell was to me very much what the Shire was for Tolkien’s hobbits. It still is that way. I could choose other places to live in New York State that hopefully would have the same appeal but without so many of the detractions of the Southern Tier. But most likely we won’t retire anywhere and we will stay in living here in Northern Virginia. I suspect while I would enjoy the sense of comfort from living in my home state again, it would quickly wear thin. I’d miss the vibrancy of living in the DC area. I’d miss the diversity, the craziness, the many opportunities to enjoy the arts, and even the lack of traffic would eventually feel deeply disturbing. I’m not sure I was born to relax. A lady I know who claims some psychic powers once told me as much. But perhaps I will be a frequent visitor, and rent a regular summer cottage in my home state. That may be enough.